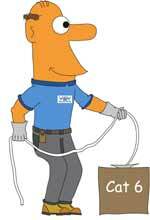 Uncle Ted's Guide To Communications Cabling - Who is Uncle Ted? Many years ago, we created Lennie Lightwave's Guide to Fiber Optics - a guide that was written to demystify fiber optics. Lennie was the mascot of our Fiber U training programs. Lennie must have hit a responsive chord, because we received requests for over 65,000 of the printed Guide and had millions of downloads from the web version, making Lennie the best known guy in fiber optics! We saw the same need for a similar simple explanation of the jargon, technology and installation of communications cabling. This led to the creation of Lennie's Uncle Ted, the cabling expert and Uncle Ted's Guide to Cabling, which became another "best seller!" One thing we've cut out is all the hype! The cabling business, as we write this, is overloaded with claims from many vendors who have to resort to hype to overcome the fact that standards make cabling a commodity. Jim and Karen Hayes at VDV Works created Cable U, the training organization at Fotec, the test equipment company they started in 1981 and sold to Fluke 20 years later. They trained over 10,000 people in person (and many times that number online) on fiber and premises cable installation, developed their own course material (which has been published as three books) and ran the biggest website in the cable business. Now VDV Works has brought Lennie Lightwave and Uncle Ted to its new website to recreate the great websites so many people came to depend on! This tutorial will hopefully get you started. If you want some hands-on training, we can put you in touch with trainers who give classes around the country or will come to your site. We're always adding training material, links to information and cabling vendors to help you find what you need to know about cable installation.